Question 1 Name the particle used by Rutherford in his experiment to determine the structure of an atom? Question 2 Explain the Rutherford’s scattering experiment? Question 3 What observation were made by Rutherford’s in his experiment? Question 4 Give the postulates of Rutherford’s model of an atom? Question 5 State one drawback of Rutherford’s model of an atom? 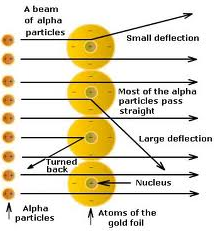 Alpha particles is a positively charged particle having 2 units of positive charge and 4 units of mass.They are emitted from radioactive elements like Radium and Polonium.The fast moving alpha particles have considerable amount of energy.They can penetrate through the matter. 1)He selected a thin gold foil. 2)The fast moving alpha particles are allowed to strike a very thin gold foil in vacuum. 1)Most of the alpha particles pass straight through the gold foil without any deflection from their original path. 2)A few alpha particles are deflected through small angles and few are deflected through large angles. 3)A very few alpha particles completely rebound on hitting the gold foil and turn back on their path. 1)As most of the alpha particles pass straight through the gold foil without any deflection,it shows that there is lot of empty space in an atom. 2)Some of the alpha particles are deflected through small and large angles shows that there is positive centre in the atom which repel the positively charged alpha particles. 3)Very few alpha particles completely rebound on hitting shows that all positive charge and mass of the atom were concentrated in very small volume with the atom. 1)An atom consist of positively charged,dense and very small nucleus containing protons and neutrons.The entire mass of an atom is concentrated in the nucleus. 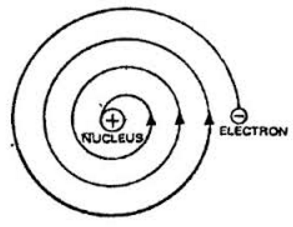 2)The nucleus is surrounded by negatively charged electrons.the electrons are revolving around the nucleus in circular paths at very high speed.These circular paths of the electrons are called orbits. 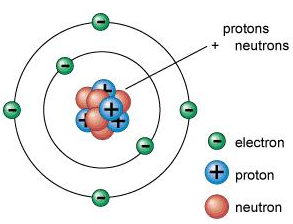 3)An atom is electrically neutral because the number of protons and electrons is equal. 4)The size of nucleus is very small as compared to size of atom. He does not explain the stability of an atom.In the Rutherford’s model of an atom,the negatively charged electron revolves around the positively charged nucleus in circular path.If an object moves in a circular path,the its motion is said to be accelerated.This means that motion of an electron revolving around the nucleus is accelerated.If a charged particle undergoes accelerated motion,then it must radiate energy continuously.Thus the energy of revolving electron will decrease gradually and their speed will also go on decreasing.And ultimately the electrons should fall into the nucleus.This makes atom very unstable and hence the atom should collapse. thank you so much for the explaination. It was so difficult for me to understand the rutherford gold foil experiment. but u made it so easy to understand this concept.thank u sooo much.